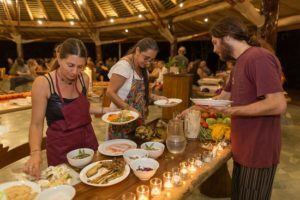 PachaMama’s organic Verde Restaurant is located in the Village Center surrounded by a lush forest teeming with hummingbirds. Three times a day, Verde offers vegetarian, gluten-free buffet-style meals inspired by a team of creative chefs. 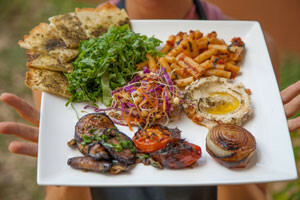 The kitchen uses all organic produce and cutting edge nutritional knowledge of raw food, vegan and macrobiotic techniques to create well balanced meals that combine the tastes of the different cultures living in the community with that of the locals. Influenced by the tropical climate, lunches and dinners always include a variety of at least three raw food dishes. Food prices are by weight – $2.50 per 100g (average price per meal is $9 – $13).